Camping in the Alabama Hills is like living in a science fiction movie and a western at the same time. The wildly shaped rocks give it an otherworldly feel, and the towering Sierra Nevada peaks look familiar as I’ve probably seen them in countless westerns. Exploring the Alabama Hills is awesome! Everywhere you turn there’s a surprise of another oddly shaped rock. The hills are irresistibly easy to climb as the rough surface provides superb traction for your footwear. There are several natural arches here. Mobius Arch Trail is a must-do for a look at this most impressive arch. 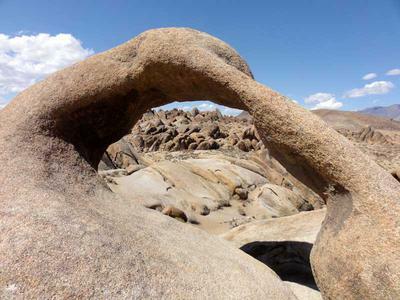 There are also several unmarked trails for exploration, and many washes are perfect for getting a close up view of these golden granite globules. Take your time and let your mind run wild in this fantasy land. 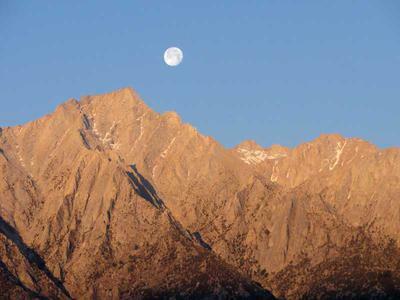 Campsite Directions: From Lone Pine head west on Whitney Portal Road for 2.7 miles. Turn right on Movie Road. You'll find many campsites along this road and along its many branches. Many of the campsites are in the Movie Flats area. There are lots of roads in that area and it is mostly flat. My campsite had a commanding view of both the hills and the majestic Sierra Nevada Mountains, with a front row seat to Mount Whitney and Lone Pine Peak. 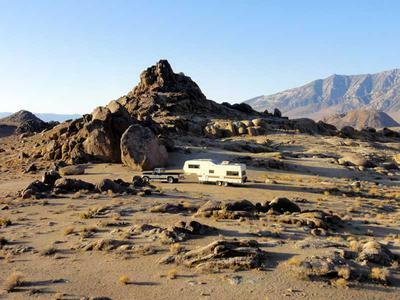 And there are dozens of other fantastic campsites in the Alabama Hills with superb views in every direction. 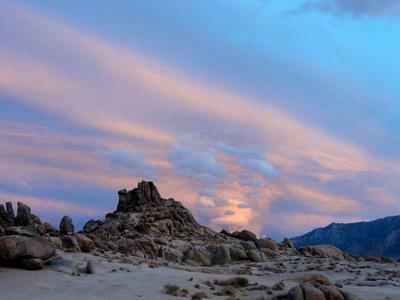 Recreation: Exploring the Alabama Hills is the thing to do here. And if you wish to reach the heights of the world, you can do that too. Just head up Whitney Portal Road where you can hike into the heavenly Sierra Nevada Mountains. Peacefulness: It’s very peaceful, even if it is a bit of a tourist attraction. Usually the only sound is the breeze through the hills, and the occasional dust devil. Air traffic is light, with only a few military jets flying by now and then. Weather: The weather was perfect during my stay in May. There were very few clouds, and the clouds that did appear were in the mountain tops or just above them. They rarely crossed over the peaks and above the valley. There was almost always a breeze, which picked up in the afternoons. It was never extremely windy. Highs were in the 70s and 80s and lows were in the 50s. Wildlife: I saw a large coyote crossing Whitney Portal Road near Lone Pine Campground. I also saw turkey vultures, eagles, ground squirrels, tree squirrels, small and large lizards, a variety of birds, jackrabbits, ravens, hawks, zebra-tailed lizards, and short horned lizards. Insects: Gnats would become a slight nuisance when there was a calm breeze. They didn’t bite, but just swarmed around me, most noticeably and annoyingly by my ears. Cell Signal: I had no Verizon cell phone signal at my campsite. I was able to get a weak signal when I climbed up into the hills. Verizon mobile broadband internet worked with the external antenna placed on my roof, but it was very slow National Access service. RV Solar: Super, there’s plenty of sun, which seems even more intense at this higher elevation. Campsite Rating: 10 out of 10. The scenery takes the cake here! Nothing else matters. But everything else was perfect too, except no cell signal. Oh well, give technology a break, it’s good for you! For more information on the Alabama Hills, see the BLM web page.